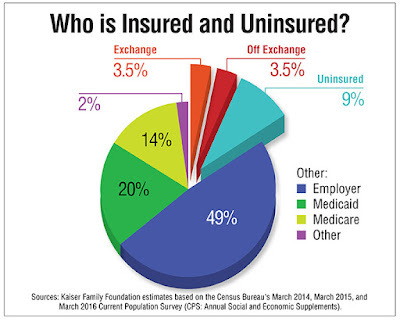 While Republicans are generally against mandatory enrollment, the blog describes what the authors view as a "death spiral" of rising costs on exchanges. They characterize exchangs as a "dumping ground" of people who had formerly been corralled in state high risk plans. On a states-rights basis, they would allow substantial penalties (higher premiums) on those who had remained uninsured in past years. The ACA does this indirectly on a pay-as-you-go basis through tax penalties for persons without insurance. They offer a "uniform tax credit" to people who buy their own insurance. (ACA exchanges offer a floating discount on insurance, rather than the mechanism of a tax credit.) They also would allow the same credit for group insurance (rather than a business tax deduction which is much more helpful for those at high incomes), and allow more interchange between "individual" and "group" markets, noting that "85% of the uninsured live in a household with someone in the labor market." They believe a defined contribution employer contribution would be more portable and flexible than the current system of the employer "paying for" health insurance. They recommend a system where there would be less churn in and out of Medicaid programs because of tax credits for staying in private insurance. Finally, for the still-uninsured, the blog proposes that "unclaimed tax credits" (e.g. the tax credit that would have been allocated to an uninsured person had he taken insurance) would be "returned to communities" and safety net hospitals. For a blog by Timothy Jost at Health Affairs on states' rights vs universal access, here. For a blog by Carolyn McClanahan at Forbes on "a workable Republican system," see here. For a blog by Laurence Koltikoff, also at Forbes, an economist's plan to avoid death spirals by providing annually, individually risk adjustedinsurance payments to everybody (e.g. today's Medicaid, Medicare, and Commercial patients; people well or sick), which they can take to any competing health plan; see here.